aura joon: A busy weekend. Thank you for all the sweet advice, friends. I decided to hold back on some of the things on my weekend to-do list and just relax, working on the things I had the energy and time to do without stretching myself too thin. I got done quite a bit of sewing, finishing two new projects. We worked in the nursery a bit, and I was so excited to come home and find that the little one's bedding was waiting for me on the front porch. It's so pretty, I step into her room a thousand times a day to see how everything is starting to come together. I hope she likes it. 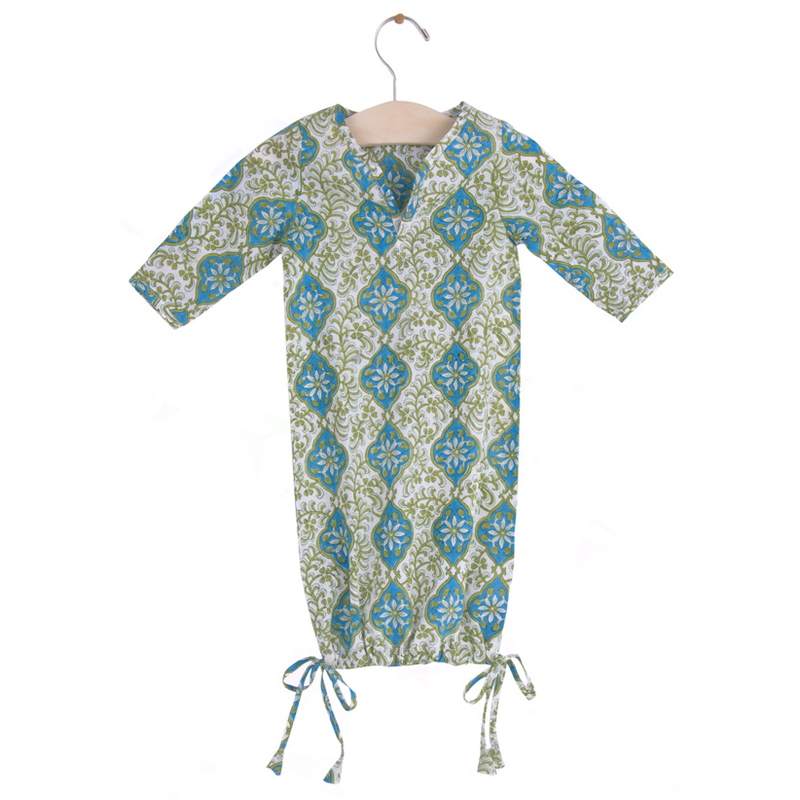 Catherine sent along this sweet little sleep sack, and I can't wait to see her in it. Isn't that precious? All these prints have me dreaming of our first trip to the beach. Hopefully this Summer we can take a road trip to stick her little toes in the sand and let her feel the ocean breeze on her new skin. 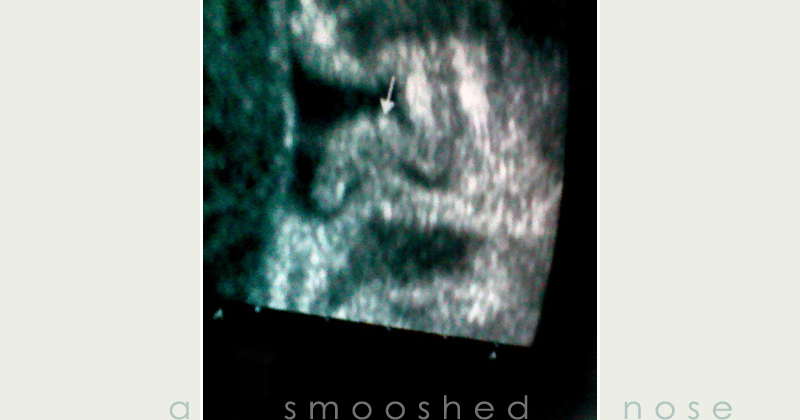 We took a peek at her on the ultrasound, to make sure she was growing alright. She weighs 5 pounds, 12 ounces, and is in the 41st percentile in size. I can't believe there is an almost-6 pound baby inside of me. The last few days, every one has been commenting on "the drop," and how she will be a March baby instead of being here on her April 1st due date. Either way, in 30 days or less, we will have a baby. I am still trying to fully grasp the thought of that, as I'm trying to figure out these last few details to get everything in order before she's here. We got this for her, this weekend. It's been one of the most exciting things we've bought. It gives me a little peek into the moments we can't wait to share with our little adventurer. Honestly, the "you'll never sleep," "get ready to never have a free moment" advice starts to get a bit old. It's not that I am romanticizing life how I imagine it will be, it's just that we're choosing to focus on our hiking trips, Summer concerts in the park, and quite moments as a new family of 3. I understand there will be poopy diapers and sleepless nights, but that's only a small part of the wonderful changes that are coming. 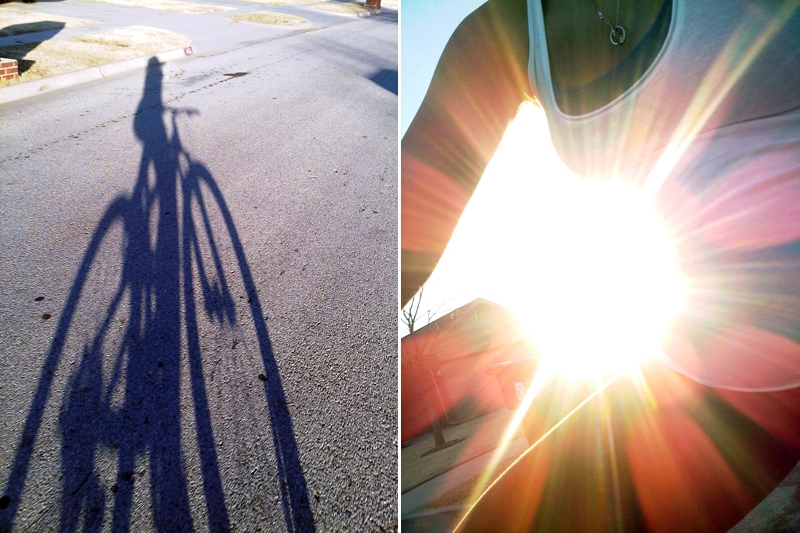 We went on a few long walks, and a bike ride to enjoy this warm, Spring weather. Probably my last bike ride, since my midwife asked that I please not waddle around on a bicycle, almost 9 months pregnant, anymore. 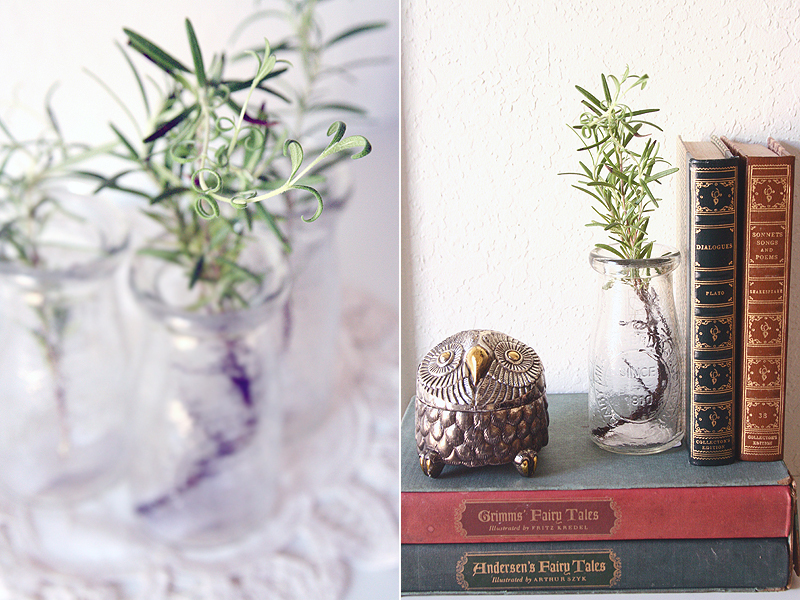 This weekend I also spent a few hours taking photos and getting things ready for the shop. I decided to take it offline for a couple more weeks, and let go of the stress of trying to get it up by the first of this month. It will be ready when it's ready. Which gives me more time to stare at these two photos for an hour to decide which angle I like better. This weekend we also saw family, ate lots of yummy Thai food and too much ice cream, ran errands, and relaxed. Maybe I didn't finish everything on my list. But I did get in some extra things like a few stolen hours to walk a few miles with my husband, pick blooming branches off the Bradford Pears, and just relax. It was just the weekend I needed. Thank you to every one that has linked this blog in the last month. In February, we had 109,370 visits. Out of those, 40,454 of you were new. So hello, new friends. Will you be keeping Petey when your baby bird arrives? Of course! I don't think we'll ever get rid of this car. Michael is convinced that Elements are the VW bus of our generation, and he wants to always keep him around. Just this year they've decided to stop production on them, I'm guessing because of low sales... not many people want to be seen driving a microwave on wheels. But we love him. Right now we're trying to decide if we want to buy another vehicle. We had planned on getting a Subaru (yes, I am going to be the wagon-driving Mom) when we had a baby, but I don't want to have another car payment, so we're just going back and forth on it. Maybe someday soon. Is it already warm in Oklahoma? Where is your cream shirt from? Is it maternity? In reference to the shirt I'm wearing in this post. I bought it a second-hand store for $5 a couple years ago. One of those stores like Buffalo Exchange where you sell back clothing. I died when I saw it, it's probably one of my favorite shirts. I think I might have gasped when I saw it on the rack, wondering why anyone would get rid of it. It is such a thin, soft fabric and it's so comfortable. No, it's not maternity, I'm still hanging on to my normal clothes for as long as I can! Being 5'2 helps, because everything was so long on me before that all my normal tops still cover my big belly. Did you make the bunting in the nursery? Yes, I made it as soon as I found out we were having a little girl. You can see it hanging on a chair in this post. I enjoy making bunting, entirely too much. Putting the fabrics together is like Christmas morning, for me. The first string of it I made was for my sister when she found out she was having a boy. 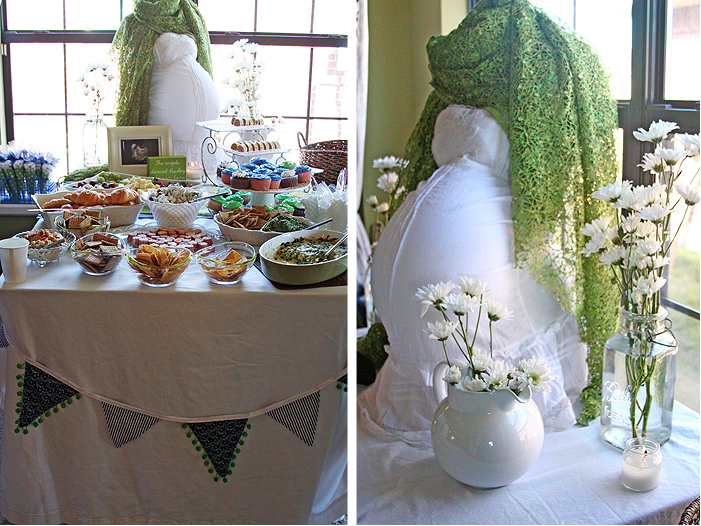 Here is a picture of it hanging on her food table at the baby shower I held for her in December 2009. There are a couple Arts Festivals I'd like to do this Summer, and I think I'm going to make a few strands to take with me. They can be pretty simple, depending on how much work you'd like to put into them. I just threw together a pattern and went off of that. Where did you get the bunny in the nursery? My Mom used to make and sell those when I was a little girl. She always had craft businesses going on, on the side. Making bows, tshirts, clothing, bunnies, wreaths, etc. It's no wonder I turned out the same way. The one in her nursery was the one she made me when I was a little one. I am going to pass it on to baby girl, and hopefully it will stay in the family for a long time. Do you have any tips/advice for a novice camper like myself? Here is a checklist I made for a camping trip we went on this Summer (the one I came home knocked up, from). It was a primitive camp - no bathrooms, fire rings, tables, or designated sites. We just drove up and set up camp. If you're just starting out you might not like that a whole lot....digging a hole to poop in isn't exactly most peoples idea of a good time. But camping is such an amazing experience and wonderful way to escape from your daily routine, center, and have time to reflect on yourself and your life. Have fun! How's Michael doing? Is he feeling nervous and excited like you? Where is the Emerson print from in her nursery? I bought all her prints off of Etsy a couple months ago. Two of them I got from an artist called The Wheatfield. I am a big, big fan of Katie's. If you've never visited her website, please do. She grew up on a farm in the countryside, so her work is absolutely dripping with all the same inspiration I find in our Oklahoma prairies. I tend to really love the work of artists who have similar inspiration to work with. Where did you get all the gorgeous blankets for your fort? The two main tapestries I bought at an Estate Sale last Spring for $4 a piece. The couple had traveled the world, and I ended up spending a whopping $200 at that sale. I have NEVER in my life spent that much at a garage sale! But it was one of the most amazing sales I have ever been to, and a friend of mine who is also an avid thrifter/garage saler and I STILL talk about that sale to this day. A professor and his wife, they traveled the world scuba diving, collecting books, maps, old trunks, textiles, and trinkets from all over the world. Our house is filled with their treasures. It's silly, but everything I look at that belonged to them is a huge inspiration for me to keep looking for new adventures, every day. I have never seen a house filled with more life and memories, than this one. It's half-way online right now, but my dream is to have a boutique, so I don't want to tie myself down too much to an online store. For now it can only be online, until Michael is finishing school and we are in a better financial situation. I don't link it much here because I feel like I'm advertising unnecessarily when my blog is more personal and not business. But if any of you are interested, there it is. 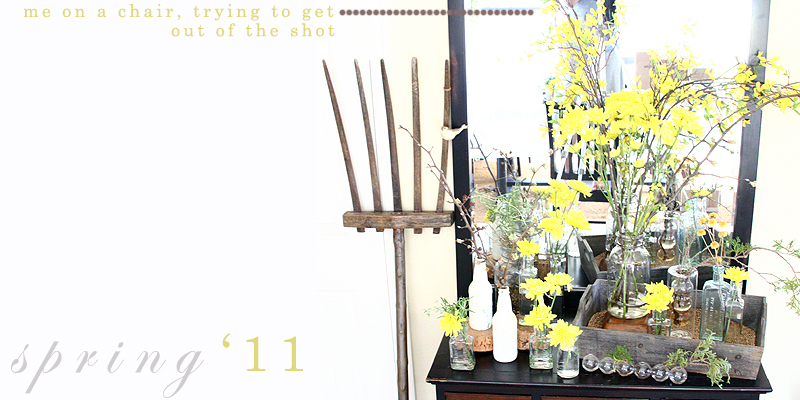 And here is an interview I did on Corey's blog in January about starting up my shop. I was so excited about it! This one was normally almost $300 but we got it at a consignment sale for $90. And you know me too well :) Some friends of ours moved to the bay area last year, and we're thinking of going for a visit next Summer, so we can hike around and camp. She just had her baby this weekend, so the little ones will be close in age, and I think next Summer when they're both a bit over a year old, will be perfect timing to start them on adventures. So stay put until next year! last time we were there we met a family from sweden. They had a 3 year old who was hiking WITH them (not in a backpack) and she was wearing mini keens. my heart melted. I love your attitude about the baby and that you are planning adventures with her too. It isn't all about poppy diapers and sleep. She is a very, very lucky little girl! "Honestly, the "you'll never sleep," "get ready to never have a free moment" advice starts to get a bit old." I couldn't agree more. Those comments started to really, really get to me!! It was like no one had anything positive to say! Well, as a mom on the other side - my boy is 6 months old - he is NOT a good sleeper BUT it's about so much more than the sleep!! and poopy diapers! We went on our first camping trip this last weekend... we've been on a few hikes now... it's wonderful. You'll have plenty of adventures to look forward to, it's amazing! Oh I love the crib! And the decorations. Everything in these pictures, actually. The idea of hiking and doing everything with the baby is great, I have one friend back in Finland who continued her busy life with a baby, doing all the hikes, agility competitions and all that with the baby with her. I love that kind of attitude! All the best for you 3! 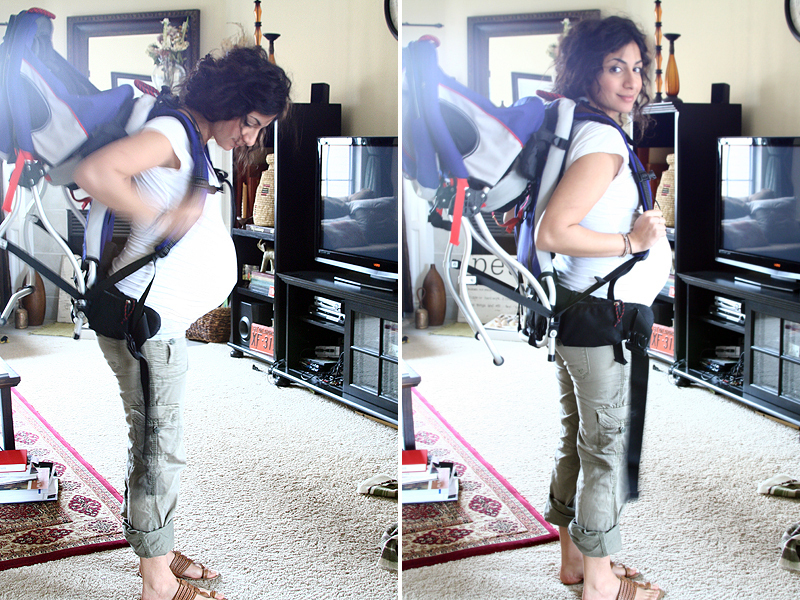 The baby backpack is the best! We started taking Avery on hikes at two months old using ours! I have to thank you for your FAQ posts...I had been looking for a good, inexpensive organic soap everywhere (I'm allergic to EVERYTHING)! I found out that a store down the street from us carries Sappo Hill and it's amazing! THANK YOU! I just had to say the nursery is so beautiful - one of the prettiest I've seen. I love that you both are excited to continue your adventures with a baby - I'm not sure why so many people like to tell you all the "bad" things about having a baby rather than all of the good things. If you start them out young, they'll turn into great little adventurers! hey aura! 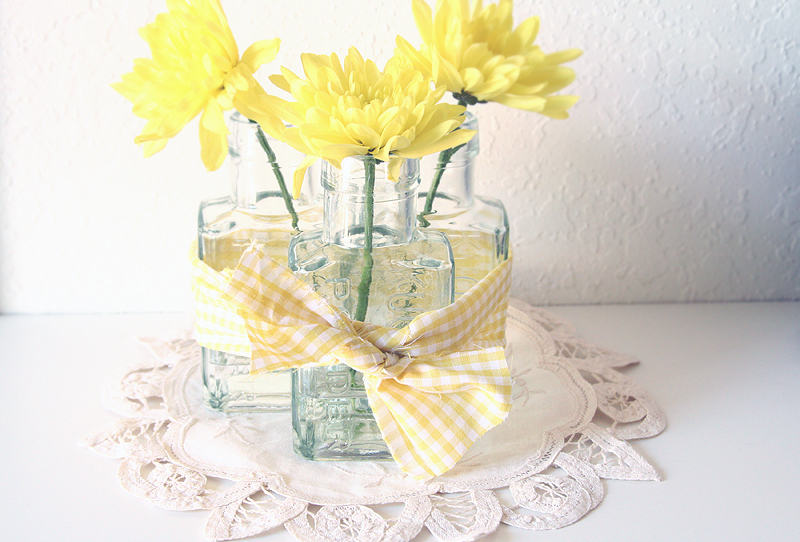 i linked to you last month-- your awesome rootbeer bottles DIY. goodness like that and your blog in its entirety are too good not to be shared so it was my pleasure! and for the record, you are a gorgeous pregnant woman!!! i can't get over how gorgeous the chest of drawers in her room is. whet a beautiful nursery! your baby bird will fit right into your fancy free life just perfectly. sometimes its challenging but so worth it. i want to hear all about your garden! have you done a 'how to get started' post before? i would love some advice! Lovely pictures. You look gorgeous with your hair all messy. Don't apologize. Happy pushing! I'm a March 28 baby and love the fact that she just might make her arrival on my birthday. How exciting that it's so soon. You look absolutely gorgeous and inspire me to stop fighting with my straightening iron and letting my natural waves go. I know you are so busy, but I was wondering what you used in your hair? While contemplating my new blog name I tried many things, in the beginning I thought of "bark and leaves" because of that gorgeous song. When I went to check if the website was taken I saw a familiar drawing and then saw your name. I thought it was such a sweet coincidence. Take as much time as you need to focus on the now, most of your life you won't be pregnant and have these precious moments. You deserve to focus on the good and the peaceful and take all the time you need to settle into mommyhood. I can't wait for you! I just have to say, you look absolutely beautiful! Regarding the negative comments and stories people like to share, I think everyone likes to share dramatic tales and often times things are exaggerated for dramatic effect. Having a baby will completely change your life...but I feel it's in a good way! Children are such a blessing and joy and I love that you are planning to continue your adventures with your baby. What a rich and blessed life your child will have, full of exciting experiences. I'm thrilled for you that you will get to meet your sweet baby soon! What a lovely nursery! Thanks so much for letting us know where the print with Mr. Emerson's quote was from. I just purchased one myself. Thanks for the FAQ! I have another question. I'm not sure how much you'll want to share about the birth of your daughter on here. But I'm quite intrigued by the idea of a home birth. How and why did you decide to do that? What is your plan? My husband was born with his cord wrapped around his neck...so they had to shock him. I would SO love to be in a much more comfortable place where I can get up when I give birth. But the safety concerns hold me back. Any advice on that would be much appreciated! I'm like you a year or two ago ;)...not pregnant...just curious! I have also been curious about where you purchased (or who made) a shirt of yours! I love the creme knit one with the flower applique you wore with the green military jacket and creme striped scarf here http://aurajoon.blogspot.com/2011/02/dressing-bump-2nd-trimester.html. you and your husband will totally LOVE that backpack once they're big enough to get in it...We have had it go through 2 children (in fact, BOTH can still fit safely in it though it's mostly for our youngest--2 yo) and it has still retained every thread. It hasn't worn down at all. My almost 4 yo actually likes to put his teddies in it and play when it's not in use! Love the prints, too, btw. I've been following your blog for a little while now. I find you such an inspiration. My husband and I are planning to have children in the next couple of years. I struggle a lot with the thought of being pregnant and the "misery" associated with it. I know it will all be worth it in the end, but sometimes my vanity gets me as I have a hard time at looking at pregnancy as beautiful. You have changed that for me. I look at all your pictures and they highlight the beauty of pregnancy. Thank you for opening my eyes and my heart. 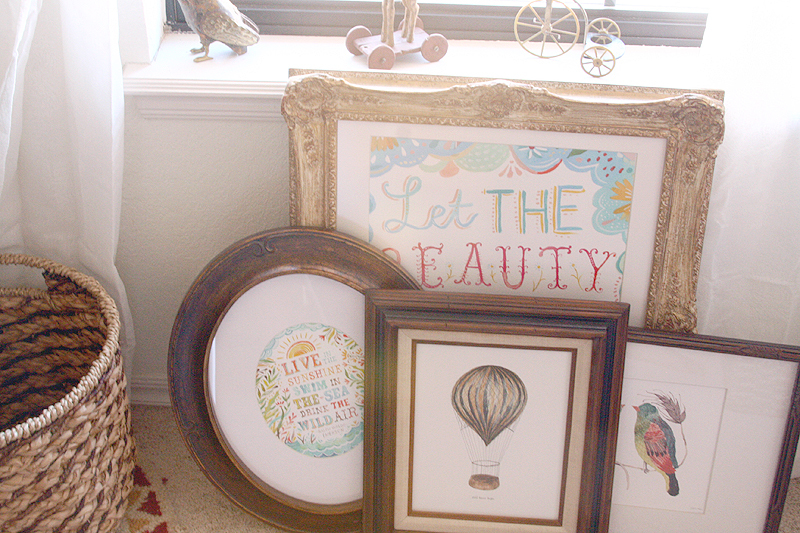 Your little one's room is going to be gorgeous!!! I love what you picked. Very exciting! I wouldn't bother too much about what people say to expect or not to expect. Every baby is different and the way you parent has a lot to do with things as well. Everyone told me the same thing they are telling you and when my little boy came along he proved them all wrong. From 4 weeks he slept through the night and has ever since. We take him camping (3 months old was his 1st camping trip) and out to dinner and on long road trips etc and he handles it as though its the norm... because it is. Thank you for sharing Katie Daisy. I'm a watercolour artist myself, and her work is very inspiring. P.S. Only you can look cute with cockatoo hair! I can understand all the "advice" getting old. I can't see myself being very patient when I'm pregnant and everyone's an expert. You can have sleepless nights in a tent :) I don't think a baby needs to confine you to the house. I think it's sad when people have a baby and you never see them again. Your house looks so lovely with all the fresh flowers and branches - Our Bradford Pear is set to bloom any minute outside our front porch... oh the joy of THAT SMELL that we discussed last year *wink* but still I'm happy to see the world waking up and wiggling it's fingers and toes for spring! I am so excited for you both! P.S. I love that you said the Element is the VW Bus of our generation that's a perfect description!!! Lol! About the diapers... I don't know why, I think I read it in a previous post or something.. I got the idea that you're breastfeeding, right? My apologies if not, I mean no offense... But if you are, her diapers are going to be HEAVEN. My formula fed baby had nasty, vile diapers. A few times we even wore masks because of the disgusting smell. Our breastfed baby only pooped like a teaspoon every 8 days because of how well his body was processing my milk. I feel honoured that you answered my question! :) Good to hear you had a relaxing weekend - rest up and enjoy the remaining time with just two people living in your home. You are so right to not listen to the downers (for lack of a better term). Sure, you get less sleep, but its for a great reason. Your new little family will adjust and find its own rythym as time goes by. And you know what? Enjoy this time of looking through rose-colored glasses. You'll never see things quite the same way again and its a beautiful thing. thinking of you in these last eternal weeks and hoping they pass quickly..
you're going to be a precious mommy & this little one is being born into a huge place of love. Do you have a list of places to hike in Oklahoma? I have always had an interest but have never been able to find a place with more than just a mile or so trail. If you have already answered this, sorry, I am new to your blog. hi aura, i came across your blog recently and have been admiring your beautiful photography. i have two little ones, and one of my biggest joys is traveling with my babies and showing them new places, so i love your attitude. i got the same negative advice you're getting, and you're very smart to take it with a grain of salt and focus on the adventures you will have with your new bundle! Hi Aura! I've been reading your blog for a few months now, but have never commented. I had a baby girl about 8 months ago and I just wanted to encourage you that it is so much more than poopy diapers and sleepless nights. My daughter still doesn't sleep through the night (sigh) but every smile she gives or baby talk she utters reminds me that there are so many things more important than getting six straight hours of sleep! i was wondering if you guys have nailed down a name yet. you don't have to share it with us or anything but i was wondering if you're picking a persian name or an american one :) i have to tell you that my husband and i both love your and your sister's names so if we ever have a daughter, we're using one of your names. hope you don't mind! it's so hard to find a persian name that works with an american accent like yours. the nursery looks fantastic btw. nice job! Sooo beautiful, as always! 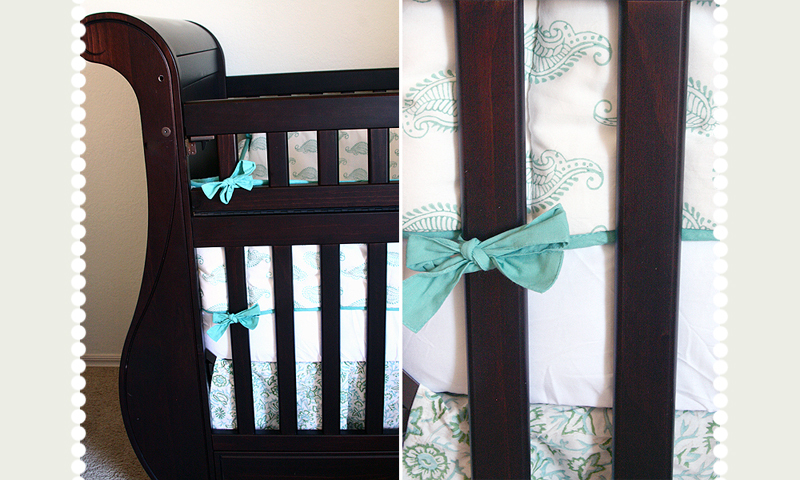 I LOVE the baby's bedding! Your posts are such a delight. Also, I hope you don't mind, I made a link in one of my posts to your lovely blog. 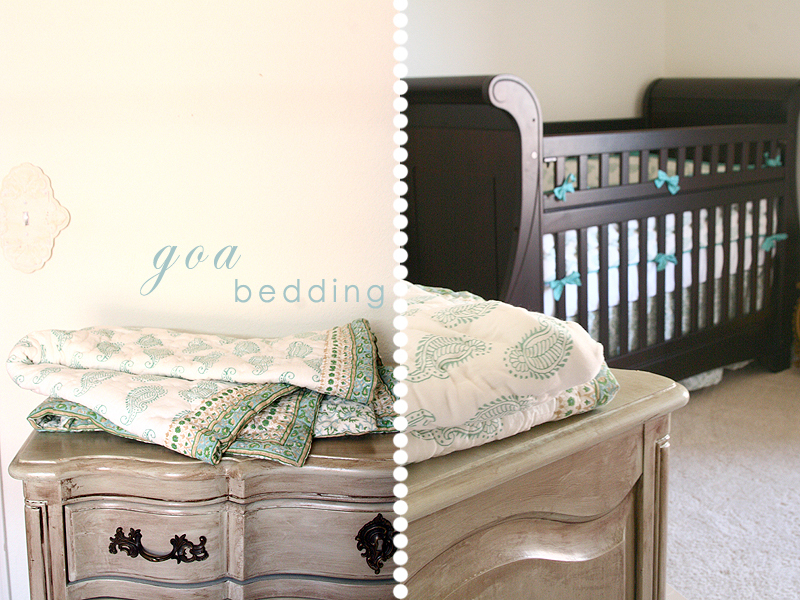 the nursery is coming along gorgeously! your little bird is going to learn to fly in her little space. and thanks for the FAQ, although now i have another question, what are in your little sachets? 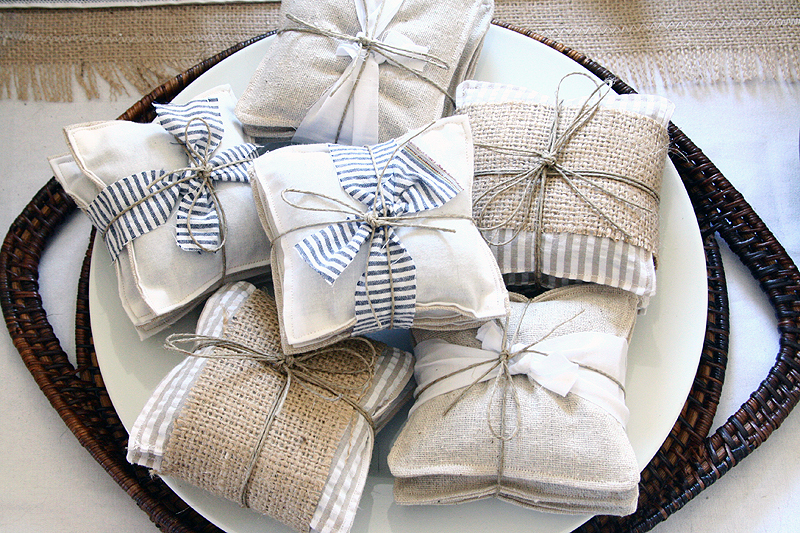 i love the look of them with the burlap and bows. I'm a bit of a sewer myself, and i always love new projects. I'd say i'm at the just past beginner stage. I learned from my mom when i was young, and have kept it going here and there. I got my very own sewing machine for christmas this past year! yay! "Wild" hair really suite you. I have a son who just turned 1 year old last week. While it is true that our first year together was filled with many sleepless nights and yes, I have never been busier in my life, I have also never been happier, or more energetic, or more grateful on a daily basis. Scratch that -- on an EVERY SINGLE BREATH basis. I know you will have the same experience of motherhood. I can't wait to see pictures of your Little Bird!!! i adore your blog so much. i can't wait to see your baby. you are going to be a wonderful mom. and you are such a talented, beautiful person. is it possible for your blog fans to send you something for your little one? if so, where can we send it? 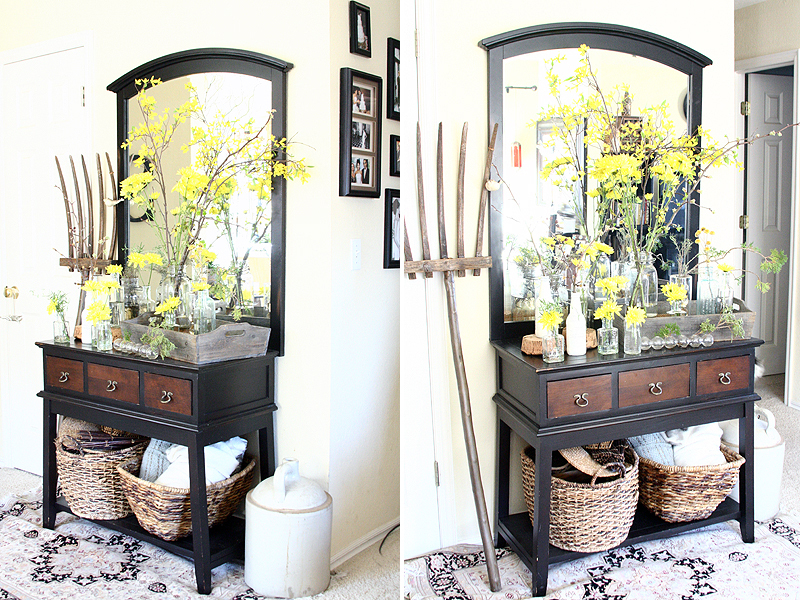 All of your photos, your baby's room, and your spring vignettes look amazing! I am so happy for you and wish you well for the springtime!! beautiful pictures, it seems you got done so much already. You must be great @ multitasking, because if I was ever pregnant, I think the whole world would go collapse around me. Wishing you safe delivery, healthy baby and an amazing journey on your future role as a mom. I know from watching some of my friends with family, they constantly wear different hats. Who makes that gorgeous sleeper? Hello Aura! I have enjoyed my visit to your blog so very much! I wonder if you might allow me to do a feature on your nursery on my website? Could you email me (uniquebabygear at bellsouth.net) please and let me know?